China has completed production of one of the world’s largest seaplanes for use in the South China Sea. 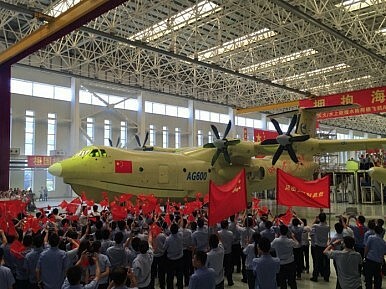 After seven years of work, China has finished production of the first Jiaolong (Water Dragon) AG600 seaplane, purportedly the world’s largest amphibious aircraft, Chinese state-owned Xinhua news agency reports. The new aircraft, developed by state aircraft maker Aviation Industry Corporation of China (AVIC), rolled off the production line at an AVIC plant in the southern city of Zhuhai in Guangdong province on July 23. AVIC’s deputy general manager, Geng Ruguang calls the AG600 “the latest breakthrough in China’s aviation industry, which demonstrates an overall improvement of China’s national strength and research capacity.” According to Xinhua, a group of 70 aircraft component manufacturers as well as 150 research institutes participated in the development process of the aircraft. “The AG 600 is like a ship that can fly, with advanced gas water dynamic engineering and underwater corrosion resistance technology,” said Huang Lingcai, the chief designer of the AG600. A first test flight of the amphibious aircraft has tentatively been scheduled for the last quarter of 2016. China has already placed an order for 17 AG600s and intends to procure up to 60 new aircraft of this type over the next 15 years. However, the Chinese aviation industry also intends to export the new aircraft. Malaysia and New Zealand have purportedly already expressed interest in procuring the seaplane. However, civilian demand for a new aircraft of this size may be limited and despite China highlighting the utility of the plane for civilian purposes, including forest fire fighting and maritime rescue operations, the AG600 will also be a useful asset for the Chinese military. As I noted elsewhere, next to conducting long-range patrols, anti-submarine warfare tasks, and mine-laying missions, the AG600 can be deployed as a military transport flying supplies and military personnel back and forth between the Chinese mainland and Chinese outposts in the South China Sea (See: “Will this Plane Let China Control the South China Sea?”). Assuming, as claimed by the plane’s developers, that the AG600 only requires a water depth of 2.5 meters for landing and take-off, it would be an ideal aircraft to supply some of China’s artificial features in the Spratly Islands given that they are surrounded by shallow water. The aircraft can also be used for maritime patrols of contested territories in the South China Sea.